Opera has released Opera 11 Beta, the latest pre-release version of its new Opera 11 browser. The main look and feel of the browser hasn't changed massively, but there are a few new bells and whistles. Opera retains around a 3-4 per cent share of the browser market and has fallen behind Google Chrome which now has nearly 10 per cent. The browser is available across Windows, Mac and Linux. Opera says it has worked hard to further boost browser speed in this new version, particularly for Linux. According to the company, Opera 11 for Linux is 15 to 20 percent faster on common benchmarks than Opera 10.63. The footprint of the browser has also been reduced by 30 per cent. The main advancement in Opera 11 is something called stacking, which enables you to "better organise your open tabs". Instead of keeping tabs alongside each other, Opera 11 enables you to group them by site or theme. While some will undoubtedly regard this as a gimmick, we think it might really have use for those of us who have large numbers of tabs open on a regular basis. To group them, simply drag them on top of one another. This is a little messy, because you can't just drag the tab across — you have to drag it off the toolbar first before you can drag it onto the other tab. Clicking the arrow icon expands the current stack across the tab bar — you can see that in action below. Opera 11 has also made some improvements to the address bar, which now hides some unnecessary information and displays the security status of the page more obviously. The address field now hides unnecessary information and puts the security status of each page front and centre. Now, badges explain the security state of the site, giving consumers clear information about the sites they visit. 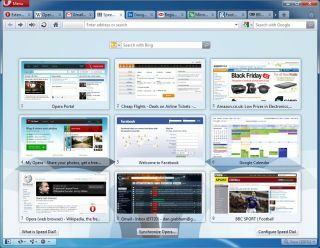 Opera 11 also introduces extensions, to bring the browser alongside Internet Explorer 9, Firefox and Google Chrome in this department. Opera says that in the three weeks since extensions debuted in the alpha release of Opera 11, more than 500,000 extensions were downloaded while developers submit between 10 and 20 new extensions each day. Extensions can be set to automatically update, too. The browser also has a developer mode so developers can launch, test and package extensions quickly. More improvement has also been made in the way Opera uses mouse gestures, originally introduced in Opera 5. Opera 11 introduces a more visual interface for this. You can download Opera 11 beta (English only) now.